The Zodiac Sign Leo Man (July 23 - August 23), Leo Personality Traits for Male born under July Zodiac signs. The Leo man is very proud, and sometimes seems unapproachable. He is an aristocrat to the marrow, in need of high society, listeners and admirers of his splendor. He may be outwardly very gentle, but those around should not be deceived by this softness because when the opportunity comes, he would show his true lion nature. The Leo man has good manners, he knows how to care for women and to be very courteous. Leo will throw a treasure of gifts and all his wide soul to his woman. His rare lady can resist his charm and brilliant splendor and very hot energetic passion. Leo man already from a very young age strives to make a career, get a good education, or at least plan out his work so to have a career in the future and a pass in the higher strata of society. This representative of the zodiacal circle cannot be contented with little, his ambitions often outstrip its capabilities, but the Leo man will not be an idle talker, as he seeks to actualize them. If the Leo man will be arrogant, but his excessive demands in life will not be supported by an adequate effort - he, in the end, will be very disappointed in life, and such a grumbler will blame others except himself. The Leo man loves a company, where he could shine. Moreover, he is always a leader and the soul of a company. For a representative of this zodiacal constellation, audience is important as the air he breathes for without listeners and admirers, the Leo man simply cannot live. He may graciously ignore the gossips and comments against him since he is generous and should forgive the weaker ones. But those around have to remember that nothing escapes his attention and falls out of his memory. If an occasion comes for him to avenge these "pricks", the Leo man will do it with satisfaction and great pleasure without thinking. The Leo man's character is sometimes difficult, and it is sometimes not easy to negotiate with him since he has his own opinion in everything. Leo man does not tolerate opposition and will fiercely fight for his point of view, even if he knows he is wrong. He can be blunt and even tactless, but for his charming smile, people forgive him everything, even deliberately uttered rudeness. Apology from this representative of the zodiacal circle should not be expected. He genuinely believes that, in the first place, "to apologize" - is tantamount to "showing one's weakness", and secondly, the Leo man always believes that he is right, and this can never be doubted. Any woman who will link her destiny with the Leo man must realize that he will never be humble and submissive, and this means that the Leo man should be loved, cared for, cherished, appeased, listened to, and for a good and peaceful relationship - it is very necessary to always compromise, refusing part of your desires. The Leo man is a possessor, he will not tolerate competition, and even an innocent flirtation, designed to inflame his passions, will be an occasion for war. And as is known, Leo takes no prisoners. It seems that this partner is self-sufficient and needs no additional support or incentives, but this is not so. Leo man really needs his muse, a woman, for which he will be able to perform great deeds and achievements, and who will be able to encourage and reassure him when he will have no strength, and create a cozy space for him. He needs a balance that will put his enthusiasm in order and stability which he would want to come back to again and again. And, of course, the Leo man needs a woman that he would be proud of, she must be a queen, for all her quiet and calm qualities of character. 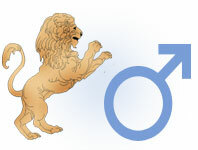 Full description of Leo Man, character traits and personality characteristic for male Leo.